Egyptians celebrate the 3rd anniversary of the 25 January 2011 revolution. Image: Demotix/Adham Khorshid. All rights reserved. After months of waiting, the presidential election committee (PEC) finally declared 26 and 27 May the dates for Egypt’s first post-Morsi presidential election. The election forms part of the military’s so-called 'roadmap' for returning the country to the democratic path following its ouster of the Morsi regime in July 2013. However, the long awaited announcement that the military commander at the helm of the ouster, field marshal Abdel Fattah El Sisi, is to run for president has made many question the institution’s motives and crystallized the notion that a full-scale counterrevolution has successfully been inaugurated. What are the chances of a free and fair vote considering the atmosphere surrounding the recent constitutional referendum, and the cult-like status Sisi has gained? What might be the role and motivations of state institutions (the deep state) and how these impact the electoral process? The current atmosphere in the country, marked by the extreme suppression of dissent and 'interference' by state and private institutions, means that the result of the election is a foregone conclusion. However, Sisi’s reign will be fraught with myriad challenges, many of which are intractable and factored into the broad public support for Morsi’s ouster. Key amongst these is the state of the country’s economy and Sisi’s inability to fully repress dissent. Assessing Egypt’s imminent presidential election, and the behaviour of the state and electoral supervision institutions, necessitates a discussion of the 2014 constitutional referendum. Held 14 and 15 January, the referendum passed with an overwhelming majority: over 90 percent of a 38 percent turnout. Though the content of the constitution is highly problematic as it extends and entrenches the powers of the military and interior ministry, the atmosphere surrounding the referendum was critical to assessing probabilities for a transparent voting process in the upcoming election. It was an atmosphere of fear and exclusion; parties such as the Strong Egypt party had members arrested for campaigning for a ‘no’ vote. Members of the Muslim Brotherhood (MB) and partners in the National Coalition for Legitimacy (NCL) advocating a boycott were also arrested. Further protests were violently curtailed, resulting in the deaths of dozens. This led many observer groups to criticise the vote, and the 1.5 billion dollars in US aid that was to be released under a special dispensation pending the outcome of the referendum is still frozen. Since the referendum, the situation has worsened. The November 2013 protest law severely limiting demonstrations continues to be enforced despite conflicting with articles in the constitution. Moreover, article 204 of the constitution now allows any crime the military deems under its remit to be tried in military courts, and article 237 mandates the military apparatus with confronting terrorism, a thinly veiled protocol aimed at dissidents. No reconciliation process has been conceptualized, and thousands of Morsi sympathizers continue to languish in jail for political crimes. This culminated in the 24 March sentencing of 529 alleged MB members to death, for the murder of Matay police chief Mostafa al-Attar in a trial that took less than two days and was flawed with all sorts of procedural discrepancies. Though the verdict has been widely criticised internationally including in the US and EU, the announcement that another 900 defendants would be similarly tried clearly illustrates the mind-set of some in authority. This decision was not a centrally coordinated one, but represents a common attitude in the judiciary and the administration towards responding to the MB and curbing opposition. 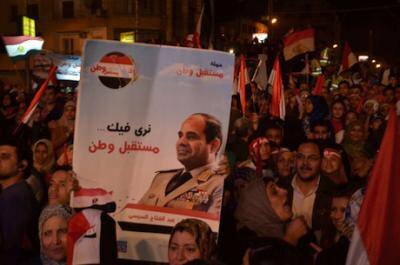 In addition, since Morsi’s overthrow, a personality cult has formed around field marshal Abdel Fattah El Sisi. Clothing, restaurant meals, chocolates, and even jewellery have been created in his image. Much of this popularity is spontaneous, but many institutions seeking to protect privileges gained during Mubarak’s 30-year rule have artificially amplified it. Thus the field marshal is regularly featured on state and private broadcast stations and continuously praised by elements close to the Mubarak regime. Sisi was even endorsed by the Supreme Council for the Armed Forces, meaning that even if he did not wish to run–a fact not borne out by his various utterances–the pressure of his cult-like status would have forced him to do so. Despite this “interference” by the military and allies of the former Mubarak regime, a February Baseera poll showed only 51 percent of respondents support the field marshal, with 45 percent undecided. This is noteworthy, since the military, headed by Sisi, has been in complete control of the country since Morsi’s ouster. The institution chose the interim president, outlined the roadmap, and consents to most security and political decisions. Around nineteen military generals have been appointed state governors in a successful attempt to strengthen the military’s hold over the state. Sisi’s 24 July call for a mandate to crack down on “terrorism” (the MB) was issued in opposition to interim president Adli Mansour’s reconciliation meeting, which was still in session at the time. The result is telling: rather than reconciling with Morsi sympathisers, large-scale crackdowns have taken place, killing thousands, the MB was declared a terrorist organization and its assets frozen. There can be little doubt about the result of the impending election: Sisi is likely to be victorious with an overwhelming majority. If the above were not enough, the new election law (presidential decree 22 of 2014) immunises the PEC from judicial oversight, meaning election results cannot be disputed in court. Candidates with criminal convictions are banned from running, serving to prevent popular candidates–many of whom were political prisoners during the Mubarak era–from emerging and contesting the election. None of this augurs well for the country. In terms of policy, Sisi has alluded to his ambition to rid the country of “terror” but has yet to announce a comprehensive election programme. Economically, however, military leaders prefer statist forms of redistribution. This is even more pertinent in Egypt, where liberalization would result in the military losing its dominant position in the economy. Currently the military is responsible for between 25 and 40 percent of GDP, is involved in industries from construction to gas exploration, enjoys access to conscript labour and land at reduced prices, and has no budgetary oversight. Already it has been reported that his campaign will begin by launching two large state infrastructure projects around housing and Suez Canal development. Sisi’s control over state institutions means that he is unlikely to be overthrown by the military, as occurred with Mubarak and Morsi. The interior ministry and the judiciary see his presidency as a bulwark against Islamism and the resurgence of the MB, and prior to resigning from the military he consolidated power. Charismatic general Ahmed Wasfi, who questioned the consequences of Sisi’s presidential run, has been sidelined, though he was touted as a replacement for the field marshal in June 2013 when Sisi’s intentions of overthrowing Morsi became clear. The likely new SCAF head Sobhi Sedki and the current heads of military and general intelligence services are colleagues who studied with Sisi, and Mahmoud Hegazy, director of the general intelligence services, is linked to the field marshal by marriage. In addition, the various constitutional protections that the 2014 constitution affords deep state institutions will act as an inhibitor. Article 207, for example, mandates the creation of a supreme police council with the power to stall interior ministry reform, while article 193 provides the supreme constitutional court full authority to choose its members, including the chief prosecutor and supreme judiciary council. It is now widely acknowledged that the interior ministry and judiciary played a critical role in ensuring Morsi’s overthrow. Sisi is not invincible, however - precisely because of the ousters of Mubarak and Morsi and the aspirations generated amongst ordinary Egyptians. The calls for “bread, freedom, and social justice” ubiquitous during the 2011 uprising can only be fulfilled if economic performance improves. This was not achieved during Morsi’s reign, due to his brief tenure at the helm and to opposition from state bodies controlling electricity and gas. This greatly contributed to the popularity of the Tamarod campaign and to Morsi’s eventual ouster. The economic situation has not improved much under Sisi’s de-facto leadership in the eight months since. Despite two stimulus packages totalling over eight billion dollars, made possible in part by the sixteen billion dollar assistance provided by Gulf states, the country’s economy remains stagnant. Official inflation–normally underestimated–stands at over eleven percent, unemployment has increased to an official figure of thirteen percent with youth unemployment at around 30 percent. The IMF projects a meagre three percent growth for 2014, down from the average five percent growth experienced between 2005 and 2010. Subsidies and debt-servicing payments are draining the country’s budget, with the deficit currently at around fourteen percent and a total debt increase to 107 percent of GDP. Electricity blackouts and gas shortages have become common and the country that in 2009 exported around 650 billion cubic feet of natural gas is now in talks to import LNG from Israel. Shortages are likely to continue, however, as the country lacks the capacity to import LNG and imported LNG is much more costly, increasing budgetary pressure. Foreign direct investment has also decreased, hindered by political instability and the country’s inability to repay the six billion it owes international petroleum companies alone. This has resulted in growing public disillusionment. The September decision to increase the minimum wage to USD180 has not yet been properly implemented, and protest actions have surged. In February 2014 alone, postal workers, garbage collectors, transport workers, and the notary undertook strike action. The doctors’, pharmacists’ and dentists’ syndicates have initiated an open-ended strike for better wages and increased investment, and, in a worrying sign for the administration, even low-ranking police officers have protested, forcing the state to promise them a 30 percent wage increase. The situation is unlikely to improve in the short to medium term, since economic growth is linked to political stability. Sisi has already acknowledged that he will not be able to work “miracles”, advocating “self-denial and hard work”, but the ousters of Morsi and Mubarak have created unattainable expectations amongst the populace. Furthermore, Sisi’s highly publicised command of the military means that were he to fail, the anger of ordinary Egyptians may well be directed at the military as well as him, at least raising a question mark over the institution’s aforementioned privileges. Sisi will also face challenges in attempting to curb opposition to his rule. Violently constraining the MB and other Islamist elements has not been successful. Despite freezing MB members’ assets, declaring the group a terrorist organization, and arresting and killing many of its members, the MB and NCL continue to operate. Protests are organized daily and their support has widened. Movements such as 6 April and Tamarod II, which supported the July ouster of the Morsi regime, are expressing opposition to the military. Youth participation in the January referendum was low, and many have become disillusioned with politics. However, the various opposition factions have not coalesced. In an attempt to begin discussions with other opposition groups, the NCL made a declaration in November dropping its call for the reinstatement of Morsi, and advocating only for the release of political prisoners, restoring Islamist media, and allowing Islamist participation in the political process. But so far, this has borne no fruit. The more institutionalized opposition, which supported the ouster despite some scepticism of overt military rule, may fragment and begin jockeying for power as it becomes apparent that a strong Brotherhood re-emergence is unlikely. The roadmap was altered to ensure presidential elections were held prior to parliamentary ones to limit space for these oppositional confrontations, and so the regime could influence which parties were elected. This measure has been largely successful; most liberal parties have remained neutral over Sisi’s candidacy, choosing to focus instead on the process of directly criticising Sisi. Hamdeen Sabahi’s entry into the race has resulted in the emergence of schisms, especially amongst young voters. This is best illustrated by the splits in the Tamarod movement, whose senior leaders, including Hassan Shaheen and Mohamed Abdel-Aziz, have resolved to back the Sabahi candidacy. Key to explaining Sisi’s popularity has been the deterioration in security following the removal of Mubarak, only worsening after Morsi’s ouster. Many seek stability and view Sisi as a strongman whose rule can provide this, at a time when lawlessness in Sinai has morphed into a full-scale insurgency, dozens of security facilities have been attacked and scores of personnel injured. The scope and range of attacks have widened, with assassination attempts on interior minister Mohamed Ibrahim and bombings in many parts of the country including Cairo. On 16 February, an attack on a tourist bus entering Israel from Sinai, claimed by militant group Ansar Bayt Al Maqdis, resulted in the deaths of three South Korean tourists. This has negatively impacted Egypt’s already dire tourism sector, which previously employed over ten percent of Egyptians. The regime’s scorched earth policy has only exacerbated this and increased anger toward the regime. Its conflation of the MB with more violent organisations such as Al-Fourqan brigades and Ansar Bayt Al-Maqdis, and subsequent violent crackdown on the MB, have no doubt led some disillusioned MB members to join these groups. Clearly, the country needs to chart a new path. A reconciliation process needs to be conceptualized and the NCL reincorporated into the political process. Both the African Union and European Union have stated that relations between them and Egypt will only be fully normalized after a fair and inclusive democratic election is held. The AU high-level panel report was strongly worded, “reaffirming the correctness” of the 5 July decision to suspend Egypt and warning that broad participation in the vote needs to be ensured. The US on the other hand has softened its position in an attempt to protect its strategic relations with Egypt and ensure its compliance with the 1979 Egypt/Israel peace treaty. US aid will very likely be reinstated, regardless of the toxic atmosphere in which the election is to be conducted; the 12 March statement by John Kerry that a decision would be made in the “days ahead” paved the way for this. The question remains, can and will Sisi effect a reconciliation process? His candidacy speech provides a glimmer of hope, stating that “all the sons and daughters of Egypt are in the same boat navigating to safety, with no scores to settle or temporary disputes to pursue…Any Egyptian, who is not indicted under the law that we all follow, is an active partner in building the future, with no limits or restraints.” His support for the violent dispersal of pro-Morsi protests, however, as well as the main thrust of his speech on fighting “fear” and “terror” in Egypt, makes most observers deeply sceptical about his commitment to inclusiveness and democracy.